A former colleague of mine, Jonathan Farley, who most recently served as a Chief of Staff in the State Senate, passed away this week after a long battle with cancer. I wish I could tell you really good stories about him, but to be honest, I didn’t know him as well as others around the Capitol. That’s part of the problem when you live over an hour away from where you work, you miss chances to really get to know people. But I knew Jon. I knew him to be a good guy. He was a hard worker who would do anything for his Boss and for his staff. Always one to have a joke when one was needed, I stayed in contact with him mostly on Facebook. From following his posts, I knew that he and I were of like minds when it came to politics … we both miss the Republican Party that used to be. Last year, before his health started to take a turn for the worst, he posted something that I believe 95% of the Capitol staff/lobbyist community clicked “like” on Facebook. I would venture that most of us clicked it because it is a perfect summation of what many of us “RINO’s” are feeling these days. Muslims are not trying to take over the world. This country was not a utopia until the evil progressives ruined it. Just because some hippies want a bike path, it does not mean that the UN is going to take over our country (with what army?) and establish a New World Order. The PRESIDENT IS NOT going to establish martial law, nor is he a foreign born 5th column communist that will wreck the country in three years. We are not a nation of moochers, and public schools and universities can’t brainwash people… The CIA spent a helluva lot of money trying and they couldn’t make it work. I don’t look up to people in the party based on their ability to “sock it to the liberals,” and I actually read the lame stream media. I go to Alex Jones’s website for entertainment, not to link some ridiculous conspiracy theory onto Facebook to prove that the whole world is out to get me. I’m also sensible enough to not see tyranny around every bill that gets introduced in a state legislature or the congress… See, I don’t have the constitution memorized, nor can I recite it in Aramaic, but I understand how a bill becomes a law and how difficult that is to get done. See, I never got into labels, but used to call myself ‘conservative’ in the sense that I truly want to be left alone… And am cynical about large groups of humans in any capacity making good decisions. It seems more and more that if you don’t believe everything I just mentioned you are a ‘moderate,’ a ‘progressive,’ or the ultimate slander…. A RINO. So I’m looking for a new name. I like “republican that isn’t bat #%^* crazy,” but am taking suggestions. I share this with you as a tribute to Jon. Rest in peace my friend. 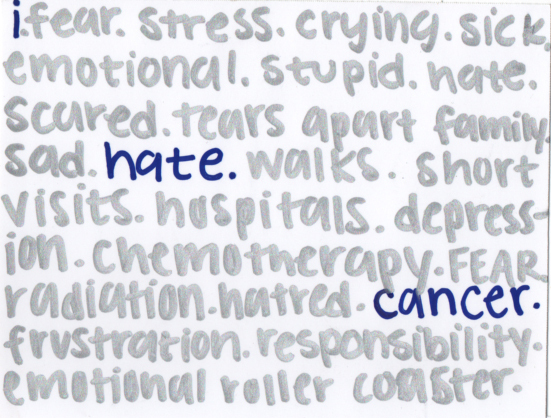 I hope you know that you are not just another person on a list of people I know who suffered from cancer. Your grace and courage and ability to stay positive throughout your fight is an inspiration to me. You are not just another casualty in the war on cancer. You, like Jimmy V, like Mark Bosworth, like Gilda … are a leader in the fight that we will win someday.